According to the NOAA report released on January 8, the average annual temperature for the contiguous U.S. was 55.3F. This is an increase of 3.3F above the 20th century average, and makes 2012 the warmest year on record. The report also states that the continental U.S. experienced its 15th driest year on record. In a Politico article, Deke Arndt, chief of the climate monitoring branch at NOAA’s National Climatic Data Center writes, “The heat that we saw in the U.S. (in 2012) is consistent with what we would expect in a warming world. Yes, that’s right, the United States comprises an insignificant 2% of the world’s surface area when we’re talking about the American heat wave in 1934, but it’s a highly significant 2% when we’re talking about last year’s high temperatures. 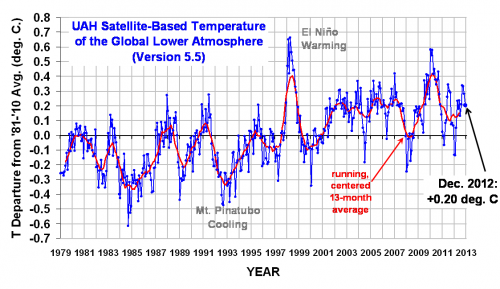 According to the global satellite temperature record maintained by John Christy and Roy Spencer at the University of Alabama at Huntsville, 2012 was the ninth warmest year globally since 1979. Previous post: How Many ‘Wedges’ Does It Take to Solve the Climate ‘Problem’?